For the varieties of Han Chinese people, see Han Chinese subgroups. "Chinese languages" redirects here. For "Chinese language" as a singular term, see Chinese language. For other languages spoken in China, see Languages of China. A 2007 study compared fifteen major urban dialects on the objective criteria of lexical similarity and regularity of sound correspondences, and subjective criteria of intelligibility and similarity. Most of these criteria show a top-level split with Northern, New Xiang, and Gan in one group and Min (samples at Fuzhou, Xiamen, Chaozhou), Hakka, and Yue in the other group. The exception was phonological regularity, where the one Gan dialect (Nanchang Gan) was in the Southern group and very close to Hakka,[which?] and the deepest phonological difference was between Wenzhounese (the southernmost Wu dialect) and all other dialects. Before 1945, other than a small Japanese-speaking population, most of the population of Taiwan were Han Chinese, who spoke Taiwanese Hokkien or Hakka, with a minority of Taiwanese aborigines, who spoke Formosan languages. When the Kuomintang retreated to the island after losing the Chinese Civil War in 1949, they brought a substantial influx of speakers of Northern Chinese (and other dialects from across China), and viewed the use of Mandarin as part of their claim to be a legitimate government of the whole of China. Education policy promoted the use of Mandarin over the local languages, and was implemented especially rigidly in elementary schools, with punishments and public humiliation for children using other languages at school. From the 1970s, the government promoted adult education in Mandarin, required Mandarin for official purposes, and encouraged its increased use in broadcasting. 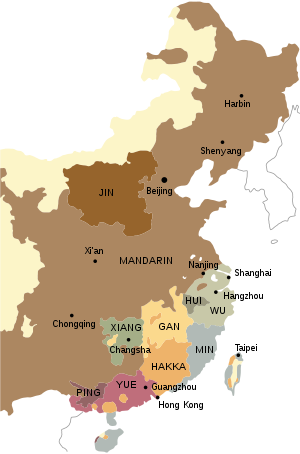 Over a 40-year period, these policies succeeded in spreading the use and prestige of Mandarin through society at the expense of the other languages. They also aggravated social divisions, as Mandarin speakers found it difficult to find jobs in private companies but were favored for government positions. From the 1990s, Taiwanese native languages[clarify] were offered in elementary and middle schools, first in Yilan county, then in other areas governed by elected Democratic Progressive Party (DPP) politicians, and finally throughout the island.